Intended for use in rounding off sharp corners. Form-relieved type corner rounding end mills may be sharpened many times without changing the form of the radius. Non-center, right hand cutting with straight flutes and a weldon shank. Made of High Speed Steel. Intended for use in rounding off sharp corners. Form-relieved type corner rounding end mills may be sharpened many times without changing the form of the radius. Non-center, right hand cutting with straight flutes and a weldon shank. Use 82 degree countersinks for deburring and for flat head screws. Use 82 degree countersinks for deburring and for flat head screws. These countersinks can be resharpened with a small mounted grinding wheel in the hole. Sizes 0, 1, and 2 have a 1/4" diameter shank. Sizes 3 and 4 have a 1/2" diameter shank. #1 to 60 high speed steel drill set. Set includes number drills from 1 to 60. These are jobber length drills with straight shanks. Jobber length drills are normal length drills. Includes a metal index for storing the drills. 115 Piece cobalt steel drill set. Set includes 1/16" - 1/2" by 64ths, A - Z, and No. 1 - 60. Cobalt drills display higher red hardness and are especially effective in drilling hard or abrasive materials. These are jobbers length drills with straight shanks. Jobbers length drills are normal length drills. Includes a metal index for storing the drills. 115 Piece high speed steel drill set. Set includes 1/16" - 1/2" by 64ths, A - Z, and No. 1 - 60. These are jobber length drills with straight shanks. Jobber length drills are normal length drills. Includes a metal index for storing the drills. 115 Piece high speed steel machine screw set. Screw Machine Drill Bit Set includes 1/16" - 1/2" by 64ths, A - Z, and No. 1 - 60. These are screw machine length drills with straight shanks. Screw machine length drills are 5/8 as long as normal jobber-length drills. These shorter drill bits are useful on mini lathes and mini mills where there isn't much distance for tools. Includes a Huot metal index for storing the drills. 19 Piece metric high speed steel drill set. Set includes 1.0 mm - 10.0 mm by 0.5 mm. These are jobbers length drills with straight shanks. Jobbers length drills are normal length drills. Includes a Huot metal index for storing the drills. 29 Piece high speed steel drill set. Set includes 1/16" - 1/2" by 64ths. These are screw machine length drills with straight shanks. Screw machine length drills are 5/8 as long as normal jobber-length drills. These shorter drill bits are useful on mini lathes and mini mills where there isn't much distance for tools. Includes a Huot metal index for storing the drills. A to Z high speed steel drill set. Set includes letter drills from A to Z. These are jobber length drills with straight shanks. Jobber length drills are normal length drills. Includes a metal index for storing the drills. Drill-mills work best on aluminum. They can be used for spotting holes instead of using a center drill. And are great for chamfering edges. Use a drill-mill to make a 90 degree angle groove. Drill-mills work best on aluminum. They can be used for spotting holes instead of using a center drill; and are great for chamfering edges. Use a drill-mill to make a 90 degree angle groove. This 10 piece TiN coated HSS end mill set includes both 2 flute and 4 flute end mills. The 1/4" and 3/8" end mills have a 3/8" shank. The 1/2" end mills have a 1/2" shank. The 5/8" end mills have a 5/8" shank. The 3/4" end mills have a 3/4" shank. The set comes in a fitted case. The LittleMachineShop 1244 20 piece TiN coated HSS end mill set includes both 2 & 4 flute end mills. The 3/16" through 7/16" end mills have a 3/8" shank. The 1/2" and 9/16" end mills have a 1/2" shank. The 5/8" and 11/16" end mills have a 5/8" shank. The 3/4" end mill has a 3/4" shank. The HSS end mill set comes in a fitted case. The set comes in a wood stand. The smaller end mills have 3/8" shanks, the 1/2" end mill has a 1/2" shank. The set comes in a wood stand. All end mills have 3/8" shank. 6 Piece 2 flute high speed steel end mill set (3/8" shank, center cut, high speed steel and single ended.) The set comes with a wooden stand. Sizes: 1/8", 3/16", 1/4", 5/16", 3/8", and 1/2". The ball end mill set comes in a wood stand. 6 Piece 4 flute high speed steel end mill set (3/8" shank, center cut, high speed steel and single ended.) The set comes with a wooden stand. Sizes: 1/8", 3/16", 1/4", 5/16", 3/8", and 1/2". Five piece, 2 flute, single ended, center cutting miniature end mill set. Ideal for precise cutting and/or working on small pieces. The 2 flute design will provide better chip removal. Single end 2 flute center cut end mill ground from solid high speed steel. Used for removing material from a workpiece and leaving a smooth finish. The 2 flute design allows for greater swarf removal but at a lower speed. If higher speed is required or less material is to be removed, consider our 4 flute end mills. Single end 4 flute center cut end mill ground from solid high speed steel. Used for removing material from a workpiece and leaving a smooth finish. The 4 flute design allows for a high feed rate as less material is removed per flute. If greater swarf removal is desired, consider one of our 2 flute end mills. Single end 2 flute center cut end mill ground from M42 (8%) cobalt. Used for removing material from a workpiece and leaving a smooth finish. The 2 flute design allows for greater swarf removal but at a lower speed. If higher speed is required or less material is to be removed, consider our 4 flute end mills. The spiral flute design permits a faster and smoother cutting action. This CNC qualified end mill is great for general milling operations. Roughing end mill ground from solid M42 8% cobalt; center cutting and uncoated. Also known as ripping cutters or hoggers, roughing end mills are designed to removed large amounts of material quicker and more efficiently than standard end mills. The 4 flute design has finer teeth than our course pitch roughing end mill and while it will remove less material, the pressure is distributed over more teeth, ensuring longer tool life and a smoother finish on high temperature alloys and stainless steel. Single end 4 flute center cut end mill ground from M42 (8%) cobalt. Used for removing material from a workpiece and leaving a smooth finish. The 4 flute design allows for a high feed rate as less material is removed per flute. If greater swarf removal is desired, consider one of our 2 flute end mills. Roughing end mill ground from solid M42 8% cobalt; center cutting and uncoated. Also known as ripping cutters or hoggers, roughing end mills are designed to removed large amounts of material quicker and more efficiently than standard end mills. This course pitch 3 flute roughing end mill will remove large chips for heavy cuts and rapid material removal. For longer tool life and a smoother finish, see our other roughing end mills in a variety of sizes. Popular for small slotting, engraving, pocketing and simmilar applications. The medium-high helix angle produces an ideal shearing cut for outstanding performance. Single end 2 flute center cut end mill ground from solid high speed steel. Used for removing material from a workpiece and leaving a smooth finish. These are high quality, American made, cobalt end mills for general milling operations including slots, grooves and other similar features. They are gound from solid M42 8% cobalt steel. The cutting areas are TiCN coated. These CNC qualified end mills feature a spiral flute design for a faster and smoother cutting action. Single end 4 flute center cut end mill ground from solid high speed steel. Used for removing material from a workpiece and leaving a smooth finish. These are high quality, American made, cobalt end mills for general milling operations including slots, grooves and other similar features. They are gound from solid M42 8% cobalt steel. The cutting areas are either Titanium Nitride (TiN) or Titanium CarboNitride (TiCN) coated. These CNC qualified end mills feature a spiral flute design for a faster and smoother cutting action. Roughing end mill ground from solid M42 8% cobalt; center cutting and uncoated. These engraving cutters can be used on mild steel, alloyed steel, stainless steel, nickel alloys, titanium, cast iron, aluminum, copper, brass, and plastics. These cutters cause fewer burs on plastics. These engraving cutters can be used on mild steel, alloyed steel, stainless steel, nickel alloys, titanium, cast iron, aluminum, copper, brass, and plastics. These cutters might cause a bur when used on plastics. Cutting Diameters: 3/8", 1/2", and 5/8"
Square shoulder milling cutters allow for a true 90° cut, combining peripherial milling with face milling. It is ideal for slotting. This 3 Piece set of square shoulder end mill have 1/2" shanks and overall length of 3" each. The cutting diameters are 3/8", 1/2" and 5/8". The 3/8"s and 1/2" end mills are single flute and require one APKT-1003 insert each. The 5/8" end mill has 2 flutes and requires two inserts. Flute length on each tool is 1 1/2". End mills use M2.5 x 6 mm insert screws and a T8 Wrench. APKT-1003 indexable inserts not included. APKT-1003 carbide coated inserts are an excellent alternative to HSS for heavy material removal. This indexable end mill requires one TPG-221 (ANSI) or TPGN110304 (ISO) insert. The indexable end mill uses TPC322 (ANSI) TPCN160308 (ISO) inserts. 1952 Indexable End Mill, R8, 1.25"
For use in heavy duty milling application. Higher metal removal rates. Great surfacing. 5427 Indexable End Mill, R8, 2"
For use in heavy duty milling application. Higher metal removal rates. Great surfacing. Unique clamping mechanism. Inserts included. 5429 Indexable End Mill, Square Shoulder, 1/2"
Square shoulder milling cutters allow for a true 90° cut, combining peripherial milling with face milling. It is ideal for slotting. This square shoulder end mill has a 1/2" cutting diameter, 5/8" shank and is 3 1/4" in over length. It uses one standard APKT-1003 indexable insert. 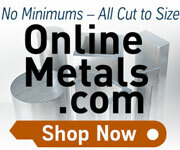 Excellent alternative to HSS, cobalt and carbide end mills for heavy material removal rates. 5428 Indexable End Mill, Square Shoulder, 3/8"
Square shoulder milling cutters allow for a true 90° cut, combining peripherial milling with face milling. It is ideal for slotting. This square shoulder end mill has a 3/8" cutting diameter, 1/2" shank and is 3 in over length. It uses one standard APKT-1003 indexable insert. APKT-1003 carbide coated inserts are an excellent alternative to HSS for heavy material removal. 5430 Indexable End Mill, Square Shoulder, 5/8"
Square shoulder milling cutters allow for a true 90° cut, combining peripherial milling with face milling. It is ideal for slotting. This square shoulder end mill has a 5/8" cutting diameter, 5/8" shank and is 3 1/4" in over length. It uses one standard APKT-1003 indexable insert. APKT-1003 carbide coated inserts are an excellent alternative to HSS for heavy material removal. This set of high speed steel chucking reamers includes 0.1240", 0.1260", 0.1865", 0.1885", 0.2490", 0.2510", 0.3115", 0.3135", 0.3740", 0.3760", 0.4365", 0.4385", 0.4990", 0.5010" reamers.